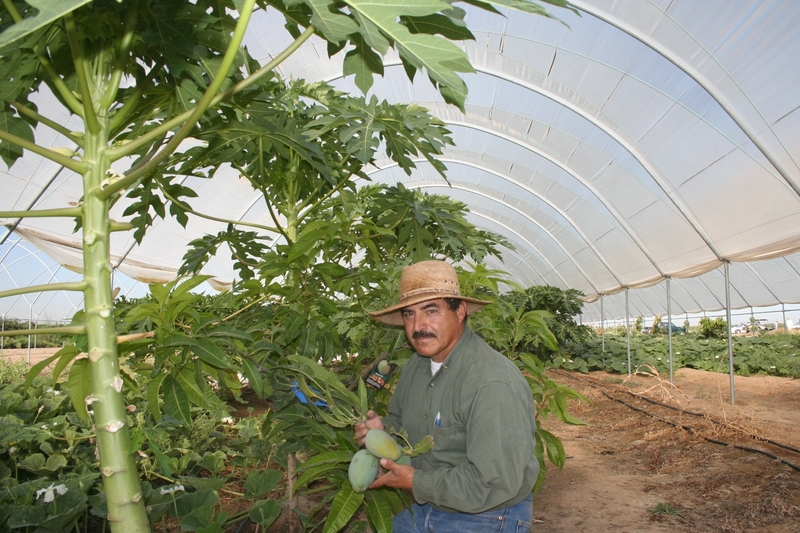 Manuel Jimenez in a Kearney research plot where he studied whether tropical papaya would be a viable California specialty crop. Manuel Jimenez went from hard-scrabble farmworker to world-renowned farming authority, all while living in and serving his hometown – the small, rural community of Woodlake, Calif. The University of California Cooperative Extension advisor, who worked with small family farmers in Tulare County for 33 years, retires in June. Jimenez has a storied California heritage. His grandmother was half Chumash Indian; his father an immigrant from Zacatecas, Mexico. The extended family of farmworkers settled in Exeter, where his grandfather, an early labor organizer, planned a strike in the 1950s, long before Cesar Chavez came on the scene. Subsequent hard feelings forced the family to migrate to other areas for work. Completing college wasn’t easy. He married his wife Olga right out of high school, and they immediately started a family. Jimenez worked in the fields and Olga in a packing house while they scrambled to find childcare. Ultimately Jimenez earned a bachelor’s degree in plant sciences at Fresno State University in 1977. Not long after graduation, he was named senior agronomist for the North American Farmers Cooperative, an organization of 300 small-scale vegetable and fruit producers based in Fresno. While working for the cooperative, he met Pedro Ilic, then a UC Cooperative Extension advisor in Fresno County, who encouraged him to apply for a new small farm advisor position in Tulare County. “I was hired in 1980 and have been here ever since,” Jimenez said. Jimenez was able to make his first mark on the industry by experimenting with a novel pest control strategy for tomato pin worm on cherry tomatoes, the most valuable crop produced on small-scale farms at the time. Growers were making 15 to 20 pesticide applications per season, and the pest developed resistance to the chemical. The heavy pesticide use also killed beneficial insects that keep leaf miner in check. The result was completely defoliated plants that produced nothing. Working with UCCE specialists at UC Riverside and UC Davis and other UCCE advisors, Jimenez conducted research proving that dispensing a non-toxic insect pheromone was an effective and economical alternative to chemical treatment. “This research really paid off because it worked on all tomato types,” Jimenez said. With this success, Jimenez became established as a valuable resource for the agricultural industry and had opportunities to share the research in statewide and international presentations. His primary goal, however, was sharing agricultural advancements with the small-scale growers in Tulare County. He surveyed the clientele, most of whom were Latino, and found they were unlikely to read newsletters or magazine articles to learn about agricultural technology. But they did listen to the radio. Jimenez established a relationship with Fresno-based KGST “La Mexicana,” one of the oldest radio stations in California, and developed an agriculturally themed morning radio program in Spanish. Later he regularly appeared on a question and answer program, Entrevistas y comentarios, with host Estela Romo. The collaboration lasted 30 years, until Romo retired. A difficult time in his career came during the recession of the 1980s when many small-scale producers lost their farms. The number of small farms in Tulare County dropped from 400 to 70. Jimenez came to realize that market forces, more than anything else, influenced the success or failure of small farms. He began to look at new market opportunities for profitable small-scale production, and saw blueberries. New Southern highbush varieties were becoming available, and, with technology to acidify the valley’s alkaline soil, he expected it to be fairly easy to grow the healthful and valuable fruit. In 1998, Jimenez established variety trials at the UC Kearney Agricultural Research and Extension Center. Each year, the planting attracts hundreds of people to the field station for the annual Blueberry Day. New varieties have been added over the years and new production practices researched. In 2012, Jimenez grafted the most common commercial blueberry varieties on the roots of farkleberry plants (Vaccinium arboreum). Farkelberry is a small, stiff-branched evergreen bush that is more tolerant of alkaline soils than blueberries. The plants are growing well, Jimenez said. The coming years will reveal whether using this technique will improve the economic viability of California blueberry production. Jimenez’ service to the people in his community is not limited to his work on the job. In 1993, Jimenez and his wife Olga founded Woodlake Pride, a volunteer organization that puts youth to work in innovative beautification projects throughout the community. The program aims to channel the young people’s time and energy into constructive endeavors and keep them out of trouble and street gangs. In time, Woodlake Pride created the 14-acre Bravo Lake Botanical Garden, the first agricultural botanical garden in California. Jimenez is now working with the City of Woodlake to secure a grant to improve the safety, infrastructure and esthetics of the garden. If the $1 million grant is approved, new restrooms, drinking fountains, and fences will be added to the community park. After working continuously since he was a youngster, Jimenez said is looking forward to traveling around the state of California when he retires. “I was born here, but I haven’t seen a lot of it. I’ve been too busy working,” Jimenez said. However, he won’t shirk either his professional or volunteer service. Jimenez plans to work with potential blueberry research successors to maintain the research plot at Kearney, and he is considering invitations from overseas’ companies to share his agronomic and community building expertise to a still wider audience. Makes me feel proud about being educated in woodlake. 1952.WUHSgrad. Have written about woodlake in CON SAFOS. Download: scholarworks@sjsu.edu/consafos/1 to read my memoirs.